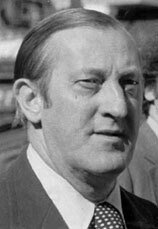 Bruce N. Freeman was a State Representative from Chelmsford from 1969 until his death in 1986. In June 1985, the first formal meeting was held to discuss creation of a recreational trail along the abandoned Penn Central railroad line from Industrial Avenue in Lowell to South Sudbury. Bruce was one of the participants in that meeting. At that time, the trail was referred to as the Lowell-Sudbury Rail Trail (or Bike Path). Bruce Freeman championed the cause of the Lowell-Sudbury Rail Trail in the State Legislature during 1985 and part of 1986. He was inspired in this cause by two other bike trails. One bike trail was the Cape Cod Rail Trail, on which the Lowell-Sudbury Rail Trail was based. The other was the Coyote Creek Bike Trail in Hellyer Park, San Jose, CA, on which he rode with a son and a grandson. Bruce Freeman, and many other Chelmsford residents, were excited about having a recreational path where people, including children, could walk, bicycle, and run safely. The railbed goes through the center of Chelmsford, connecting it with the Little League playing fields and with residential neighborhoods to the West and South of Chelmsford Center and to the North of Rt 495. The rail trail will provide an alternate path to the busy Routes 27, 4, and 110, which are unsafe for pedestrians and children. Bruce Freeman, who was involved with the Eagle Scouts and was attuned to the needs of the community, saw great benefit to his constituents in Chelmsford from this rail trail. After his death from cancer, Carol C. Cleven was elected to his vacated seat in the Legislature. 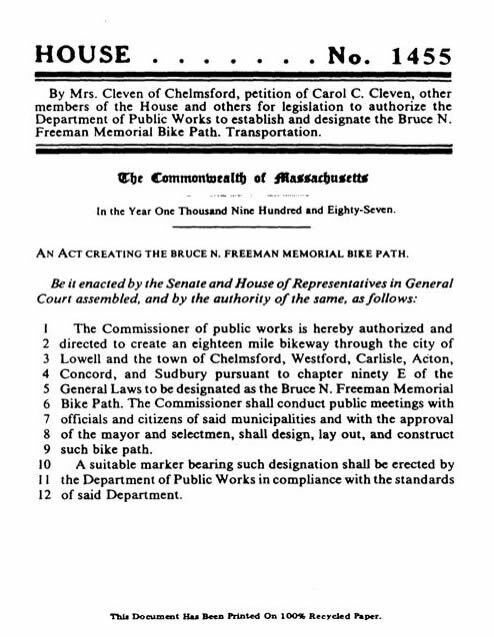 In her first speech to the Massachusetts House of Representatives in 1987, she introduced a Bill creating a bike path in his honor, as a lasting memorial to his service to Chelmsford and the State. In April 1989, H.1455 was signed into law by Gov. Michael Dukakis. The proposed bike path, which would stretch from Lowell to South Sudbury, was a favored project of Rep. Freeman’s and would be a most fitting tribute in his memory. As many of you know, he served as Representative of the 16th Middlesex District from 1969 until his death in June 1986. He was my predecessor. In June of 1985, state and local officials and interested citizens met to discuss the possibility of preserving open space land by turning an old railway bed into a bicycle path. Eighteen miles of this railway stretches from Lowell to South Sudbury, passing through the towns of Acton, Carlisle, Chelmsford, Concord, and Westford. The Cape Cod Rail Trail, which has been an extremely successful 20-mile bike path passing through several Cape Cod towns, could be used as a prototype or model for the proposed Lowell-Sudbury bike path. The Department of Environmental Management engineered the Cape Cod project and acts as a controller. The bikeway was fully constructed by the D.P.W. The design work was reviewed by the D.P.W.’s Project Review Committee. Funds for construction were made available from a line item in the Department of Transportation’s bi-annual bond issue. The bond issue was submitted as a legislative Bill that was approved by the General Court. The rail track for the proposed trail is divided into three segments by ownership and usage. The B&M Railroad owns outright the section of track from the Lowell Railyards to the point where Lowell meets Route 3. The Executive Office of Transportation and Construction owns the track from the Lowell Route 3 intersection to South Acton. This section of rail is non-operable and has missing tracks. E.O.T.C. also owns the final stretch of track from South Acton to South Sudbury, but leases it to B&M Railroad. B&M drives a freight car once a week on the length of this section. E.O.T.C. may be willing to lease the land to D.E.M. If the D.E.M. outlines its proposed plans to E.O.T.C., usage to rights of the property could be transferred without monies being involved in an appropriation. The first section of land would need to be taken by emminent domain. The approval of the various towns involved would have to be sought. The proposed primary uses of the rail trail are bicycling and recreational. Eventual linkages with other existing and planned bikeways highlight the potential for the proposed facility to become part of a larger bikeway system. A network of shorter trails could feed off the main bikeway. Desirable links could take the user through a park, to a museum, past historical monuments, and along the Merrimack and Concord Rivers. Specific destinations may include the Lowell National Park, the Minuteman Historic Park, State Forests, and the Chelmsford Historical District. Secondary uses would be hiking, jogging, horseback riding, and, during the winter months, cross-country skiing and showshoeing. Staff of the Department of Environmental Management Bay Circuit Program view this bike path proposal most favorably. It has also met with much enthusiasm from citizens of the involved communities. My fellow colleagues representing the towns of Lowell, Sudbury, Acton, Carlisle, Concord, and Westford are also enthusiastic about the project. I urge your support of this Bill which would provide recreational opportunities to many of the youth and adult citizens of the Commonwealth and which would be a most fitting tribute to the late Representative Bruce N. Freeman. The establishment of this bike path meant a great deal to him. Thank-you Mr. Speaker and Colleagues. Follow-up: H.1455 subsequently passed by unanimous vote.